betray or countermand almost any conscious intention of the collectivity. Paul returns from an evening walk through the streets of Arrakeen and strips off his stillsuit. He enjoys the privilege anonymity and envies the lives of the people. He decides that being under seige is the fate of power. Chani brings in the coffee service he won from killing Jamis. Paul notes that he and Chani have changed little physically in his twelve years as emperor and he regrets all the violence being done in the Atreides name. Chani orders him into bed and begins messaging his legs. She wants to discuss Irulans desire for a child. Chani is concerned that she has given him no heir and he tells her that a child would give Irulan too much power and might mean Chani's death. He closes his eyes and envisions an apocalyptic future, he sees a way out though... dissengage. He tells her she'll be the only mother of his child, she asks if he's "seen" it but he has not. He has a flasback to a meeting with Irulan upon her return from Wallach where she was pressing the issue. Irulan threatens to get pregnant by someone else and claim the child is his. Paul responds by warning that he'll have her killed if she does. Paul wishes he could end the Jihad and separate the goodhead forced on him. They decide to take a trip to Tabr, Chani tells Paul he belongs to the Fremen but he says he belongs to a vision. He sees a way to end all the hatred but at a terrible price. He has to weigh his love for Chani against the lives of billions. He's succumbed to the lure of the oracle. He feels this may have fixed him on a single track and wonders if the oracle predicts or creates. Chani tells him that the tribes have revived the old rites and blood sacrifices. Paul turns out the lights, thinks of the resistance to the ecological transformation and returns to Chani in bed. I was just reading this chapter, and something that struck me was when Chani mentions that a big sandworm had been sighted by the sheild wall, they don't often come that far north because of the new moisture levels. The shocking bit is the size of this big worm though, she says around 100 meters in length. In Dune there were worms with diameters of 100 meters or more and no one was surprised, hell, Paul called one that was over 2 kilometers in length. I just imagine the physcological damage it must do to a fremen to not merely see a decline in big worms, but to have so accepted this loss as to be impressed by one as tiny as this. I think FH deliberately threw that tidbit about the size (something only a reader intimate with the first book would notice) as foreshadowing of just how lost the fremen way of life already was at this point. A Thing of Eternity wrote: I was just reading this chapter, and something that struck me was when Chani mentions that a big sandworm had been sighted by the sheild wall, they don't often come that far north because of the new moisture levels. The shocking bit is the size of this big worm though, she says around 100 meters in length. In Dune there were worms with diameters of 100 meters or more and no one was surprised, hell, Paul called one that was over 2 kilometers in length. I just imagine the physcological damage it must do to a fremen to not merely see a decline in big worms, but to have so accepted this loss as to be impressed by one as tiny as this. Maybe big ones didn't go that far North? Paul was in the deep desert when he took his test. Near Cave of Birds, I believe. Frank Herbert wrote: ...his whole life was a limb shaken by the departure of a bird . . . and the bird was chance. Free will. That chapter contrasts so much with the former and yet the two have a disturbing point in common. Here the narrative is dominated by Paul's inner life, and the reader is remembered of that inner life, connecting the book with Muad'dib's epiphanies in DUNE. Even including dialogues with Chani and Irulan, the focus is introspection, while chapter 2 is full of dialogue, however ponctuated by Scytale's private thoughts. Then I get to the sad point in common: conspiration is seen intruding even in Paul's bed, as Chani's wishes to have a son and perpetuate the Atreides House are not the same; and they have to be wary of everything, the poison detector is there to remind us of that, etc. Thing is, this aspect in common only enphasizes Paul's solitude and introspection! Think I remember now why I loved Frank's storytelling. "The hearts of all men dwell in the same wilderness." This quote may address many things, but here I think it pertains to the ecological transformation on Dune. We hear of a few examples in this chapter of a longing for the past among the Fremen, even in Chani in her desire to go back to Tabr. 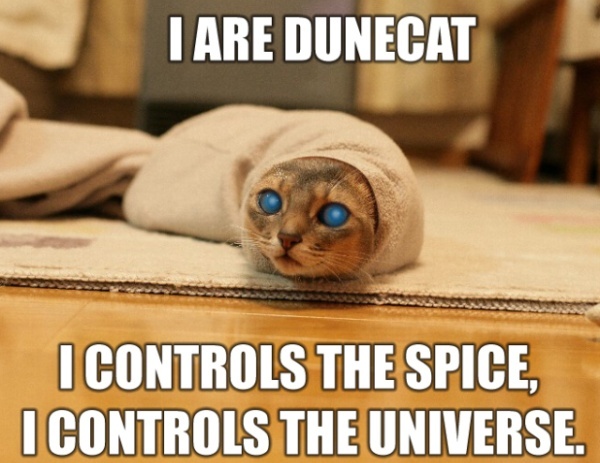 The Fremen all believe they want Arrakis as a garden, but they unconsciously resist the change in their desire to retain or go back to the old ways. The Fremen dream (change) is undermined by the Fremen spirit (tradition). I've found that the epigraphs don't always deal with the chapter they introduce, it almost seems random. I've been wanting to do a study of them to see if there's some kind of order to... I'll get to that one day. The epigraph from Chapter 02 seems appropriate for this chapter as well, as we're seeing in the most intimate setting the fragile relationship between Paul's human desires and between his 'godhead' (i.e. his great abilities).